Christmas is just around the corner. If you’ve got children of your own or kids on your shopping list to buy for, you might want to consider getting them a CloudPet. 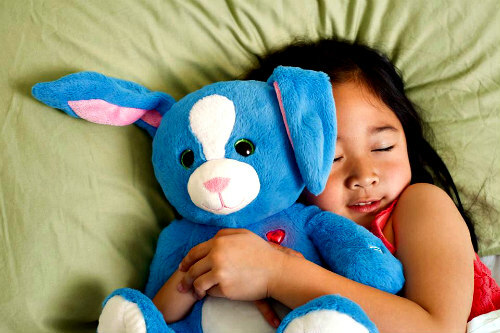 CloudPets are the perfect present for little ones and pet lovers. So, what’s a CloudPet? 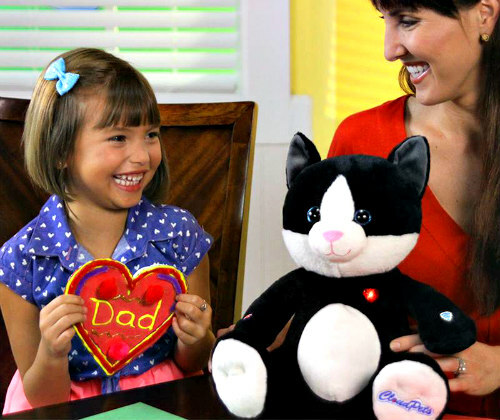 It’s an adorable stuffed animal that comes with a recording feature so you can tape personalized messages for the recipient of your thoughtful gift. Personalized gift giving doesn’t get any easier than this. And it’s not just a one-time taped message children will experience when they receive a CloudPet. CloudPets Friends can record and send messages using the CloudPets app from anywhere in the world. This is especially useful for parents and family members in the military thousands of miles away to stay in touch. While children are hugging their CloudPets gift, they can hear the familiar voice of a loved one and send them back a message of their own. How’s that for going the distance? As a security feature, parents or guardians at home get the message on their CloudPets app and then approve it and deliver it wirelessly to the child’s CloudPet toy. When the animal receives a message, its little heart starts blinking. In order to hear a message or to record one, all you have to do is squeeze the animal’s paw and the message plays or records. The message goes wirelessly to the nearby device, and from there it can be delivered to a CloudPets Friend anywhere in the world. 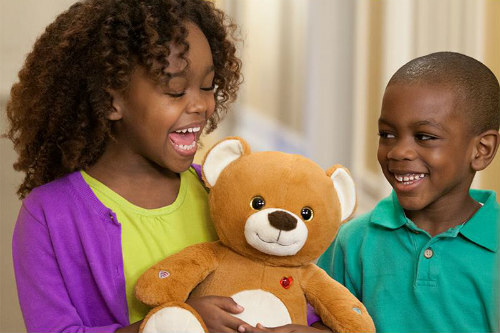 There’s still more fun in store for kids with CloudPets. That’s because they can access a growing collection of learning games via the app as well. Barnyard Sounds is the first game in the series of educational games to get kids “moo-ving” in the right direction. Access the game right from the CloudPets app dashboard and it sends animal noises to your child’s CloudPet and then plays those sounds in a particular sequence. Your child then taps out the same sequence on the game interface before starting again. The more your child plays, the more challenging it becomes. Kids love a good bedtime story. If you own a CloudPet, you can access stories from the app’s dashboard as well. At this point, you can choose from one of two fun-filled tales: Sassy Cassie or Worst Parents Ever. Once you select the story your child wants to hear, it sends automatically to their CloudPet. The story time feature also allows you to control the duration and volume of the stories directly from the app and ends a story at any time with the animal's off switch. Besides a cuddly friend to snuggle up to and a story at bedtime, kids can hear lullabies as they drift off to sleep holding their teddy tight. You can get to lullabies from the CloudPets app dashboard and choose from five different tunes that include Ba-Ba Black Sheep, This Old Man, Twinkle, Twinkle, Little Star, Welsh Lullaby and even the classic Brahm's Lullaby. Users can control the playtime duration (up to 15 minutes) and volume of each song directly from the app. This feature is capable of being shut off in the same manner as story time. There are plenty of fuzzy little critters to choose from when selecting a CloudPet. Right now you can get a puppy, kitty cat, bunny rabbit, teddy bear, elephant and even a unicorn, but there’s no telling what adorable animal they’ll come up with next. CloudPets work with Android devices and iPhone/iPads with Bluetooth 4.0. If you have any questions about compatibility with your particular mobile device, you can check their website oe go on Amazon for more information. 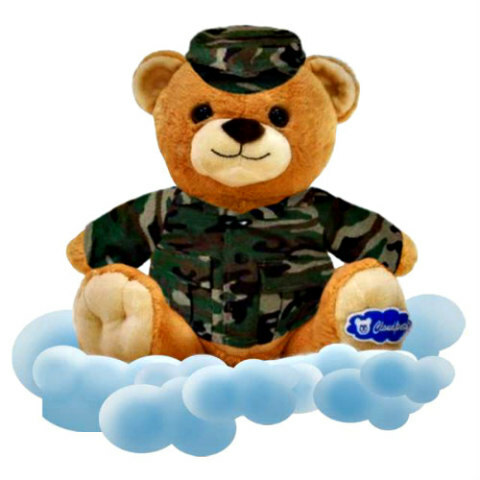 Oh, and FYI: shipping is free to all active military members.